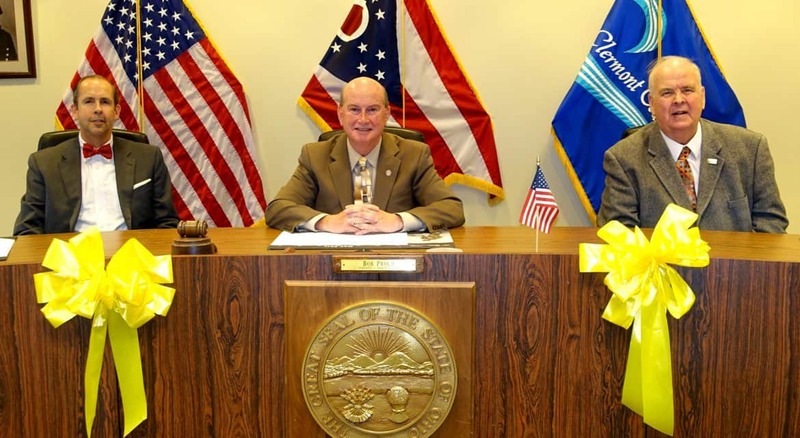 From left, Commissioners David Uible, Bob Proud (president in 2016), and Ed Humphrey. BATAVIA, Ohio (Dec. 5, 2016) – Clermont County Commissioners approved a 2017 General Fund operating budget of $54.9 million at their Nov. 30 session, an increase over 2016’s $53.2 million budget. Sales tax revenue, which provides 50% of General Fund revenue, has continued to increase, according to Sukie Scheetz, Director of the Office of Management and Budget. Sales tax revenue in 2017 is estimated to be $28.4 million compared to $27.5 million in 2016. The county will maintain its minimum 33% operating reserves in 2017, to protect against any volatility in revenue sources, Scheetz said. That is enough to cover four months of operating expenses.